We have seen the left make demands of others they could never expect of themselves, but now they have shed all appearance of at least having moral claims to their stance, they have now shed all civility in their attacks. The Left knows if they don’t take back both houses, they could face a set back that is unthinkable to them, expect the Liberal Left to move to new depths of depravity. The liberal left knows they are in trouble, latest polling, which at one time showed them with a sizable lead, now shows the numbers tightening, this can only be seen as a movement in the GOP’s favor, something the left just can’t figure out right now how to overcome. Almost overnight the DNC has seen polling slip from a 16 point lead to the figures we now have, today there is shown a 4% lead by the DNC, but also a 4% undecided, in election times these usually slide towards the incumbent party. If the Liberal left loses this election, and then 2020, you will see a party in full disarray, even worse then they already are. They have given up on presenting a message, when they do it is something as stupid as Pelosi telling her constituents, “I will raise your taxes,” like this is going to draw her a huge following. Kind of reminds me of the newest AT&T commercial, a man comes up to the house, knocks on the door, and then proceeds to offer a deal to the man of the house that has him paying more, getting less, all while acting like he is giving him a great deal. I have to ask, “Does the Liberal Left really think Americans are this stupid?” Sadly I turn on the TV, watched Tucker last night talking to a African American man who held a event called Reparation Happy Hour, he got over 150 young white people (for the most part), to pay so the, as he termed it, Brown and Black people could drink and socialize without white people, yet on their reparations. I sadly hung my head and thought, yep, our liberal left youth are truly this stupid. Seems these people forget, it was the minority of whites that owned slaves, yet it was 620,000 lives lost (that would be equivalent to 6.2 million lost today), all while fighting to end the blight called slavery in the South, you want reparations, I would say the bill was paid in blood. and if you wish to be technical, what about the fact that in the South Free Blacks had a higher percentage of slaveholders then whites did? In New Orleans over 40% of the free black population owned at least one slave, what about them. What we have is a generalization by the RACIST liberal left, facts and historical accuracy means nothing, rhetoric and feelings mean far more. But it does not stop here, the left showed their true colors with Roseanne, they screamed to the high heavens when she made a tweet that was without excuse, refused to accept her apology, then had the show shut down right there on the spot. While I am no fan of Jaret, feel she is a disgrace as a person, one of the largest dangers to the US behind Obama, a great danger than anything we have faced since the 2nd World War. But as a person of Jewish heritage I have seen what racism can do to a people, there is no call for racist attacks, but to claim what she did was unforgivable, yet that same night Samantha Bee had aired a show where she grossly suggested Ivanka sexually entice her father, then called her the “C” word. If anyone had said this about Michelle or one of Obama’s kids, the left would still be screaming for their head, but because Samantha said she was sorry, this was all forgiven. Can we say double standards? 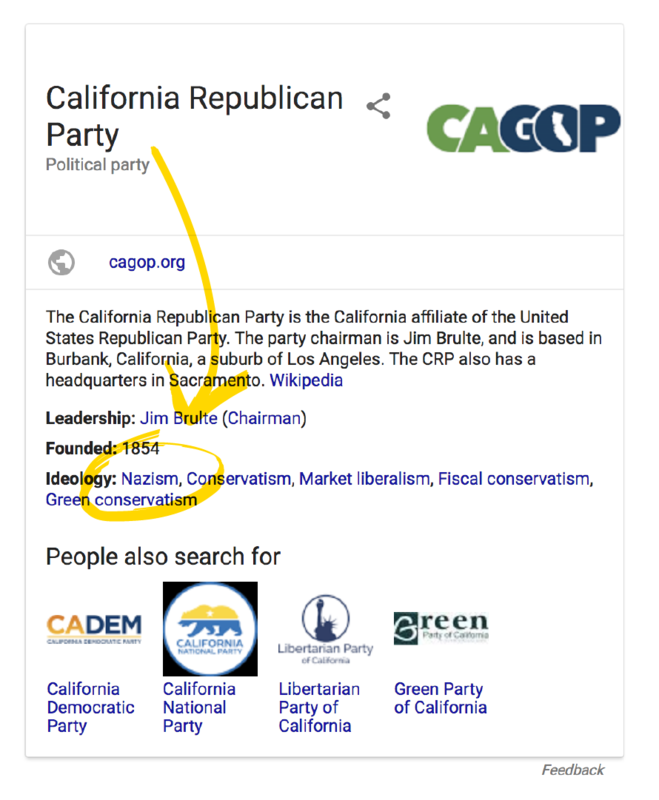 What is more, you now have platforms like Google and their ties to the liberal left, they put out a definition of the California GOP as having ties to Fascism or Nazi’s, of course, they took it down, but what type of idiot put this up in the first, place? I think we all know the answer to that, a loony liberal. This was not corrected until Vice ran a story and Kevin McCarthy also brought it to national attention. The left seems to not realize that the nation is watching this, it is not the far left I care about, Lucifer could run for office, as long as he says he is a liberal, they would vote for him, but the Center Left, Center Right voters that are seeing this, they see the madness displayed for all to see, the very ones that voted for Trump see your disrespect and hatred for them, and you think they are going to vote how you wish? I think we will see a repeat of this election coming up, sorry about the language, but every time I see this, for some odd reason it just picks up my spirits. As I have said before,”Be careful, when you are in a minority, attacking the majority, more so when this one makes up 70% of the population, if they tire of it, you may find what you and your fathers fought for, due to you are acting just like the people that oppressed you, you may find all that great men and women fought for, gave up their lives to fight for can and may be undone in a very short order as the people you are trying to prosecute and attack tire of it and realize they do make up the overwhelming majority. What to do about China’s espionage and Intellectual Theft? Democrats Claim Trump Stormed Out Of Meeting.